“Why did the melon have an elaborate wedding ceremony? Because it cant-aloupe!” joked Ben Hittie, a 21-year old from Carlisle, Pennsylvania. “My brother made that one up,” he added as he laughed at himself. Hittie, with his infectious personality, first picked up a guitar in sixth grade. Now in his senior year at Penn State, he has learned how to play six different instruments, including piano and drums, and music has become a part of his everyday life. Hittie has been involved in the organization since his junior year of high school. After one of the first few weeks of attending, he was recruited to play guitar for their “clubs,” what Young Life calls weekly meetings that seem more like a party. Hittie said he wants to change high schoolers’ opinions of what it means to be a Christian. While he has used music as a means to make an impact on others’ lives, he has ventured outside the realm of Young Life and deepened his musical talents. In addition to playing in a blues band with his brother Jon, Hittie played in several different bands in high school, experiencing what it was like to play on stage and express himself through writing his own music. Those experiences shaped the leader and musician that Hittie is today. Allison Gasparetti is a New Jersey native and currently a senior at Penn State University. In December of 2016, she will be graduating a semester early with a degree in Broadcast Journalism, a minor in French/Francophone Studies, and a certificate from the John Curley Center for Sports Journalism. Allison recently traveled to Rio de Janeiro in September to provide coverage of the Paralympic Games for the Associated Press. She is currently on staff with Big Ten Network’s Student U, where she has gained valuable live production experience, and is also a producer of In The Game, an Emmy Award-winning production that dives deep into sports stories with local and national impact to create a magazine-style show. 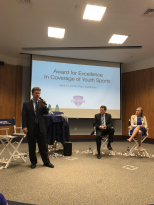 She takes great pride in being a reporter and past producer for Penn State Sports Night, a student network-affiliated show centered around Penn State athletics. 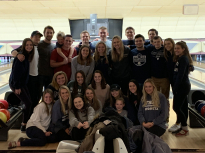 She has enjoyed being a member of several student organizations on campus, in addition to her part-time job and various other activities at Penn State. You can visit her personal portfolio at allisongasparetti.weebly.com or follow her on Twitter @a_gasparetti.